Irish import Jungle Cat has won the $500,000 Group 1 Sir Rupert Clarke Stakes (1400m). The Godolphin seven-year old was at long $15 odds with Ladbrokes prior to the race, but made full use of the mid-field draw to edge Dollar For Dollar at the line and win. With Group 1 glory already to his name, high-profile feature races were always the target as the stable returned down-under. It was also the aim for jockey James Doyle, who claimed his first Group 1 win on Australian soil. Jungle Cat, above, wins first-up in the Group 1 Sir Rupert Clarke Stakes. Photo Credit: Steve Hart. “It’s been well documented, I spoke about my experiences here, I think it’s the best thing I’ve ever done in my career” Doyle told Racing.com after the win. Saturday’s win marked four straight victories for the impressive veteran of the track. 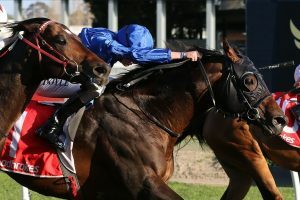 The Sir Rupert Clarke Stakes is a great lead-up to the $500,000 Group 1 Toorak Handicap (1600m) at Caulfield on October 13, a race Charlie Appleby’s champion Group 1 winner should enter as the favourite for. “Group 1 semi-final races in Europe, there aren’t too many around to be honest with you and the ground is always on the easy side” Appleby said following the win at Caulfield. Tony McEvoy’s Dollar for Dollar was unlucky to finish runner-up after leading for the entirety of the race. Meanwhile, race favourite Land of Plenty finished third while second-elect and fellow Irish import, Home Of The Brave, finished middle of the pack. “There was more pace than I thought there’d be,” Appleby admitted. “I thought Home of the Brave was getting an early pitch around there, but James followed him around and once he leveled him out and got stuck into him, he’s not for lying down,”. Although he isn’t nominated for October’s Toorak Handicap just yet, Jungle Claw may bump into the likes of Land of Plenty, Home Of The Brave, Showtime, Osborne Bulls and Peaceful State again in three week’s time. For now, Doyle is simply looking forward to what could be a big Spring campaign ahead. “Charlie’s a great trainer, one of the best in the world, the nicest guy you could ever meet, I’ve been lucky enough to ride for him on many occasions”. Full Toorak Handicap odds can be seen here.